If we can't fix your IT problem, you don't pay a penny. Our friendly, reliable and cost effective Computer Support Service currently serves most of London and North Surrey. See the map and full list of postcodes to the right. 10am to 10pm, seven days a week. Alistair Mann: evenings and weekends. We will discount you £5 off your first bill if you mention this website when making an appointment. If we can't fix your IT problem, you don't pay a penny - it's as simple as that. There's no call-out fee, no travel-time fees, no charges above the hourly rate except where we buy parts on your behalf. 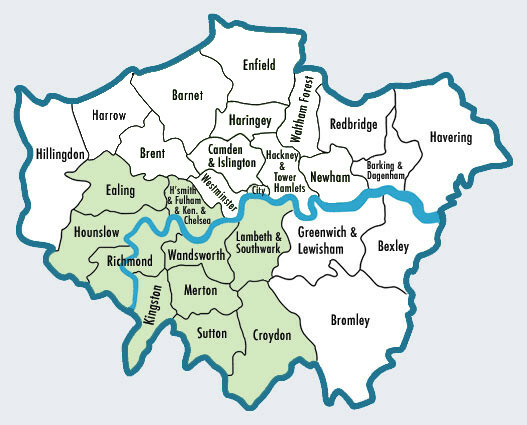 We currently serve most of London and the surrounding areas. Please see bottom of the page for a full list of Postcodes covered. If yours is not listed, please contact us to see if we can visit you. No charge for email or telephone support to existing customers. Where a problem may take longer to solve than expected, a quote that caps the total charge can be made beforehand. Any parts needed are billed in addition. The self-employed who are trading as a Limited Company are treated as self-employed. *Appointments with 2+ weeks' notice 20% of IT Support appointments each day are offered at a much reduced rate, and are very popular with those wanting preventative maintenance. Demand is high, so the notice period is usually around two weeks. During some periods, the notice period may be longer. Excluded from reduced rates excludes work outside of our usual area, and major data-recovery work. For further information, call and ask!